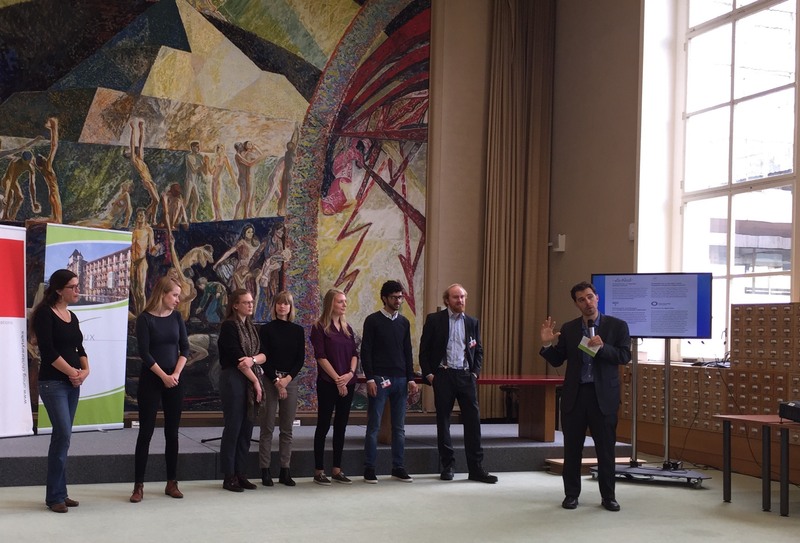 On Thursday, May 4th, IIMA and VIDES attended an enlightening event at the UNOG Library organized by the foundation “CAUX – Initiative of Change”. The event, “Youth Breaking Barriers of Exclusion”, brought together stories of young volunteers who made big changes in their community through their self-managed initiatives. Barbara Hintermann, Secretary General of CAUX, gave her welcoming remarks, highlighting how this meant to provide a space for young leaders and give them a voice. Four projects have been presented: small audiences joined in turn short presentation from each one of the young protagonists. Among the projects, the “Sprachcafé”, by Anita Ruggiero and Jessica Eggenschwiler, a weekly event organized to bring together newcomers in Basel, Switzerland. There, the newcomers can meet locals and socialize, creating a familiar environment where they can practice German. A great project to enhance integration and cultural exchange! Another protagonist of the event was Bjørn Ihler, Norwegian and survivor of the Anders Breivik terrorist attack in 2011. Deeply moved by the episode and its impact on Norway, Bjørn self-developed a programme to find out what drives people to extremism and possible solutions. Bjorn’s programme is part of the project “Extremely Together” by the Kofi Annan Foundation, aimed to gather young leaders to help the fight against extremism. Two coordinators of “Thrive”, Lisa Goddle and Abdullatif Alabdullah (who is a refugee himself), explained how their one-year old, online platform helps refugees in Geneva find a job in the highly competitive city. The coordinators are all young students whom, through “Thrive”, help refugees highlight their skills and competences and commit to show to companies that to employ refugees can be a powerful asset. Salome Schmid shared with us her experience in co-founding “La Red”. Working with refugees, she discovered she just wanted to “do more” for the migrant community in Fribourg, having seen first-hand how lost and disconnected migrants can be in such a small town. Starting from zero, La Red is now a vibrant community: locals are involved in organizing activities, including French and German courses, which the migrants greatly benefit from. Unfortunately, this wonderful project is now jeopardized: the house where the center is held is about to be demolished and “La Red” community is looking for a new place they can call home. We hope that they are able to find a new place in Fribourg soon where they can continue with this beautiful project! This highly interactive event highlighted how it is possible to change our communities from the very bottom. These young individuals have been able not only to improve the status of persons in more difficult situations, but to change from within the approach of locals. They all represent honorable examples of the changes needed to create a society with no barriers.